Acidity or heartburn is becoming increasingly common. There are many reasons to blame for it. It could be because of bad lifestyle and dietary habits like eating out very often, eating spicy food regularly, skipping meals etc or it could be due to stress, lack of sleep or heredity. No matter the cause, acidity can be very disturbing and painful and can become severe if it's not taken care of. • Avoid skipping meals and follow proper meal timings. • Avoid eating spicy food on a regular basis. • Get proper sleep. A minimum of 6-8 hours of sleep is necessary. • If you are overweight, aim at reducing your weight and maintain an ideal body weight. • Quit alcohol and smoking. Alcohol will increase the symptoms of acidity and heartburn. • Avoid having a late dinner. Finish dinner 2-3 hours before bed time. Along with these, drink plenty of water to neutralize the stomach acids. Avoid depending on antacids as it could have long-term side effects. 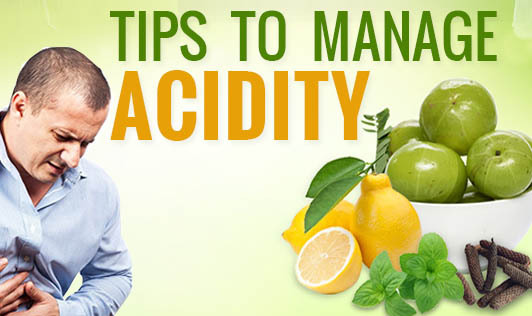 It is always better to manage acidity using naturally available foods. In severe cases, medical attention would be necessary.